October and November set a new record minimum ice extents for their respective months. November was 800,000 km2 below November 2006, the previous lowest November. The record respective monthly lows continued through March 2017 (Figure 1), when the ice reached its annual maximum extent on March 7. It was the lowest maximum in the 38-year satellite record. The high surface temperatures (Figure 2) were both a cause and an effect. Fig. 1. Arctic ice extent for autumn 2016 through late winter 2017. Credit: National Snow and Ice Data Center (NSIDC). Fig. 2. 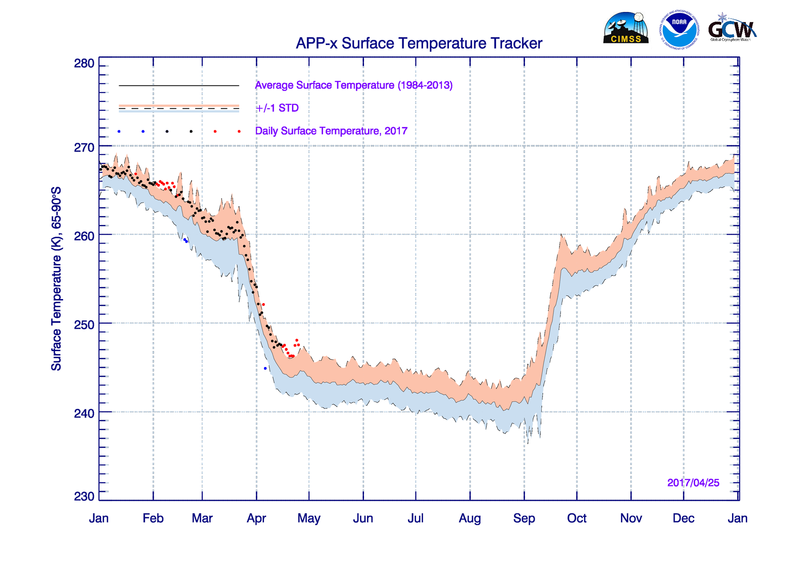 Arctic surface skin temperature from the AVHRR Polar Pathfinder-extended (APP-x) product. Seasonal sea ice loss began exceptionally early this spring in the Chukchi Sea near Alaska. While multiple polynya are common during the spring offshore of Alaska’s northwest coast, this year, the area of very low concentration ice grew rapidly during the first half of May. By May 15 there was open water as far north as 72N, which extended 100km and more west of the coastal shorefast ice. In recent times, 2008 is the only vaguely similar year, when there was considerable open water at mid-May south of 70N. However, this large an area of open water at this point in the year appears to be unprecedented. This remarkable event is due to a combined influence of both atmospheric and oceanic factors, such as the unusually mild winter that northern Alaska experienced, and there was virtually no multi-year ice in the eastern Chukchi Sea this winter. The 2017 melt season was remarkable for the Chukchi and Beaufort Seas. 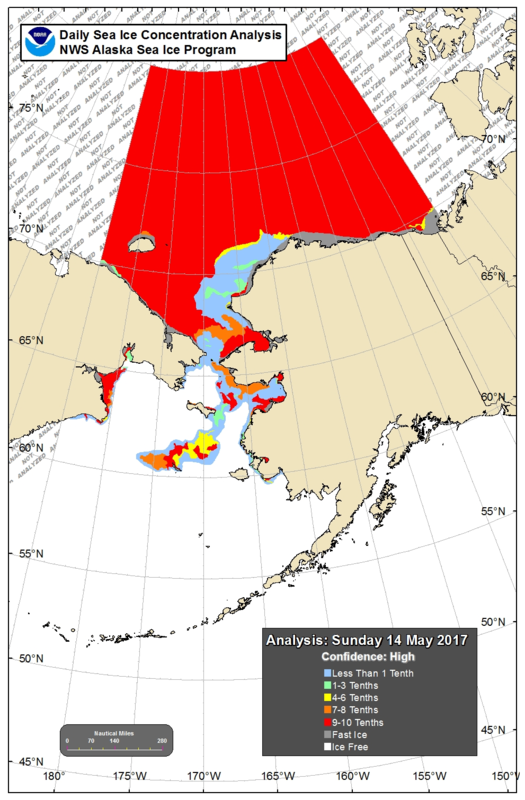 Seasonal sea ice loss started very early in the season, with considerable open water on the Alaskan side (east of 170W) of the Chukchi Sea as early as mid-May. By mid-July the central and eastern Chukchi Sea had open water to Pt. Barrow by mid-July. At the end of the July the only ice that remained in Alaskan navigational waters was scattered and broken first year ice offshore of the Prudhoe Bay area, which melted out by mid-August. Ice gradually cleared along the north side of the Chukotsk Peninsula during June and July. Ice cleared on the south and east side of Wrangel Island by the end of July and was gone near the island by mid-August. Over the eastern Beaufort Sea, open water appeared in late May and early June in the Mackenzie River delta and west of Banks Island. However, under the influence of persistent onshore winds, ice returned to the west coast of Banks Island later in June and remained into late August. Based on high-resolution multi-sensor analysis by the US National Ice Center, the combined ice extent for the Chukchi and Beaufort Seas preliminary reach its minimum extent on Sep 10, though remained very close to this value past mid-month. This was the 5th lowest of record, just slightly higher than 2007 but significantly above 2012. Fig. 4. 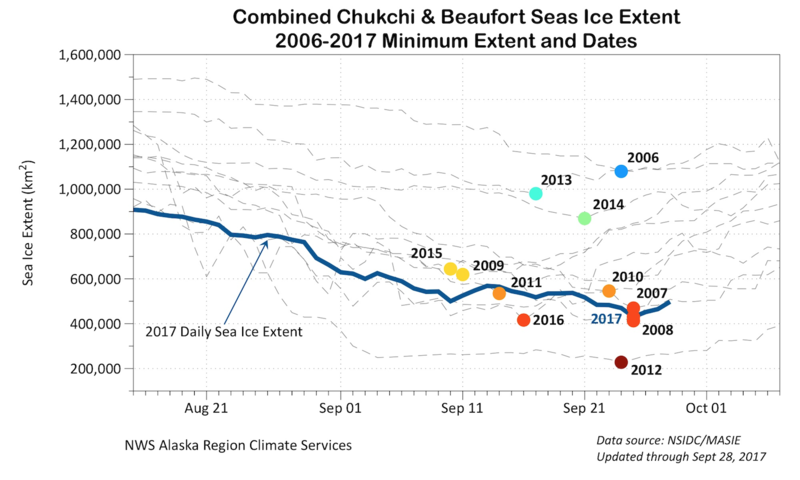 Combined Chukchi and Beaufort Seas ice extent for late summer in each year from 2006 to 2017. Sea ice has been very slow to grow in the Chukchi and Bering seas during autumn 2017. Significantly above normal sea surface temperatures at the end of summer and a parade of storms across the region during October and early November have resulted in very slow ice growth, even right along the coast. The high-resolution Multisensor Analyzed Sea Ice Extent (MASIE) database, archived at NSIDC, shows the combined Chukchi and Bering seas ice extent 46% below the 2005-16 median extent for mid-November, and the lower resolution passive microwave analysis shows 2017 to be lowest in the satellite era (Figure 5). Sea ice extent in the Bering Sea alone is even more anomalous, 84% below the 2005-2016 median for mid-November and is also the lowest for this point in the season in the satellite era (Figure 6). Fig. 5. 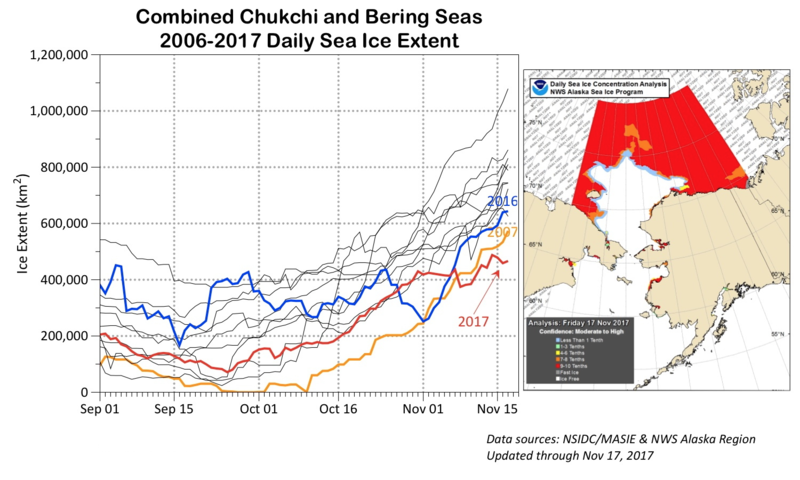 Combined Chukchi and Beaufort Seas ice extent in mid-November 2017 compared to previous years. Fig. 6. 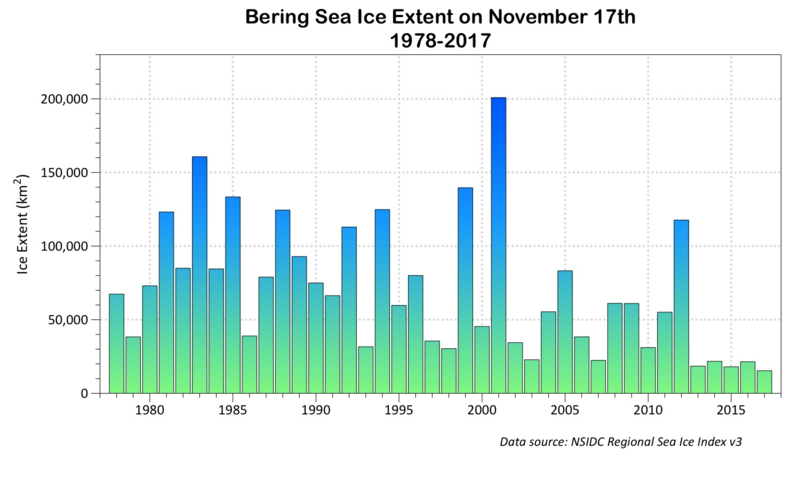 Bering Sea ice extent on 17 November from 1978 to 2017. Sea ice growth in the Chukchi and Bering Seas was exceptionally slow during the autumn and early winter. Sea ice extent for the Chukchi Sea from the passive microwave database, as reported by the National Snow and Ice Data Center, did not reach 95 percent of the basin until December 31, easily the latest in the 40 year record (Figure 7). Sea ice was largely absent from much the Bering Sea until after the first week of November, and was at record low extent (for the satellite era) for much of late December and the first days of 2018. Warmer than normal sea surface temperatures during the late summer and early autumn preconditioned the seas for late freeze-ups, and frequent storminess and intrusions of warmer air from the North Pacific region both kept ice from forming, and what ice did form was mobile and unstable in many nearshore areas accustomed to stable ice by New Year's Day. The lack of stable ice had significant impacts on hunting and fishing activities in some western Alaska communities. Fig. 7. 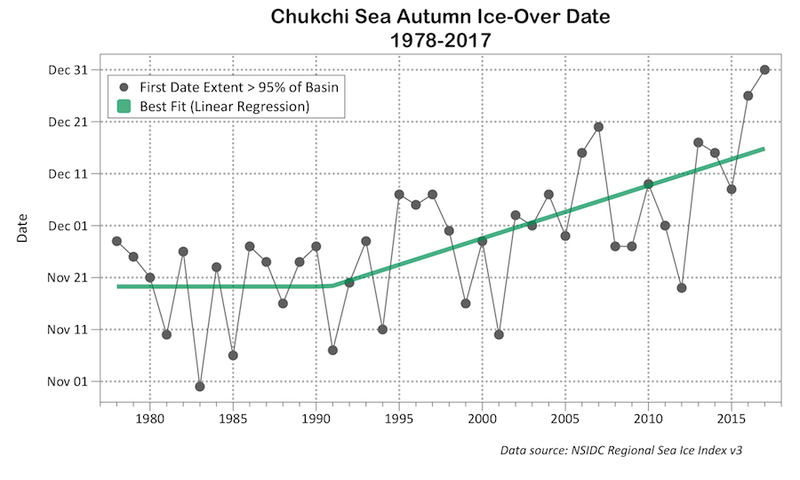 Time series of Chukchi Sea autumn ice-over date since the 1970s. 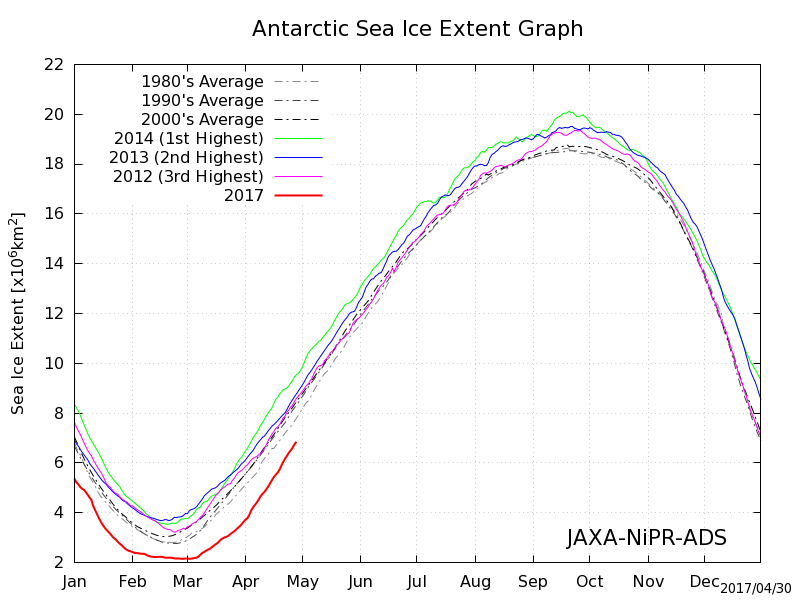 Antarctic sea ice extent is well below normal for the year (Figure 7). 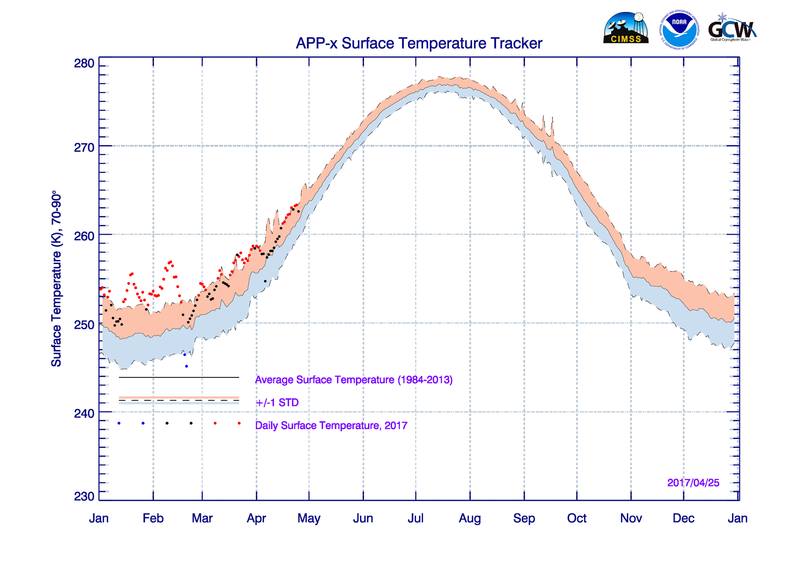 As in the Arctic, the above-normal Antarctic surface temperatures (Figure 8) both lead to, and result from, lower sea ice extent. Fig. 7. Antarctic ice extent for autumn 2016 through late winter 2017. Credit: JAXA-NiPR. Fig. 8. Antarctic surface skin temperature, averaged over the area 65-90 degrees South latitude, from the AVHRR Polar Pathfinder-extended (APP-x) product. 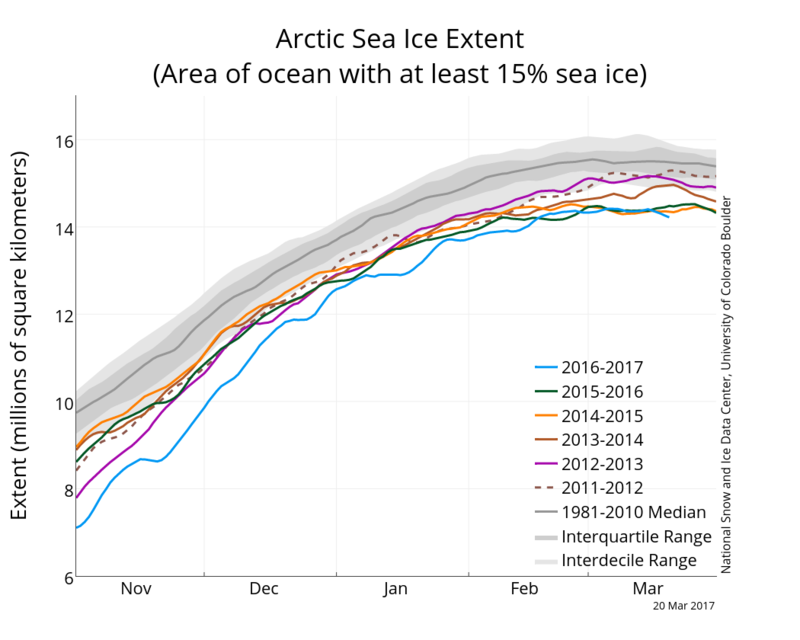 NSIDC, "2017 ushers in record low ice extent"
NSIDC, "Arctic sea ice maximum at record low for third straight year"